Coal ash pond that was the site of a spill into the Dan River in Rockingham County, North Carolina. Courtesy of Duke Energy. US federal authorities have launched a criminal investigation into a massive coal ash sludge spilled from a Duke Energy (NYSE:DUK) power plant into a North Carolina river, which supplies drinking water for nearby towns. Prosecutors are asking the company and state regulators to hand over reams of documents related to the early February accident, which Duke waited nearly two days to disclose publicly. The firm initially said as many as 82,000 tons of ash, enough to fill up to 32 Olympic-size swimming pools, spilled into the Dan River after a pipe broke under a 27-acre ash pond at its coal plant. The spill, one of four known major toxic leaks in North Carolina within a matter of weeks, forced authorities to treat the drinking water supply for Virginia, Danville and South Boston in order to remove toxins. 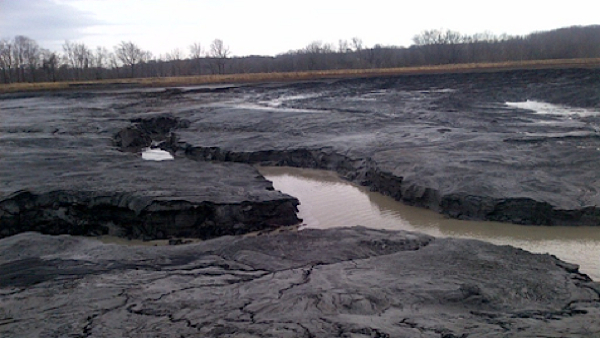 It was the third-largest coal ash spill in US history. On Saturday, Duke said a second pipe under the coal ash dump is not in immediate danger of collapse, despite concerns from state regulators that the pipe could fail and trigger another toxic spill into the river, AP reported. Conservation groups have accused the state environmental regulatory agency of protecting Duke Energy, the country's largest electric utility, and of failing to enforce laws against polluting waterways with coal ash. They attempted to sue Duke last summer, alleging that for years it has allowed toxic coal ash to seep into waterways from 14 coal-fired plants in the state.